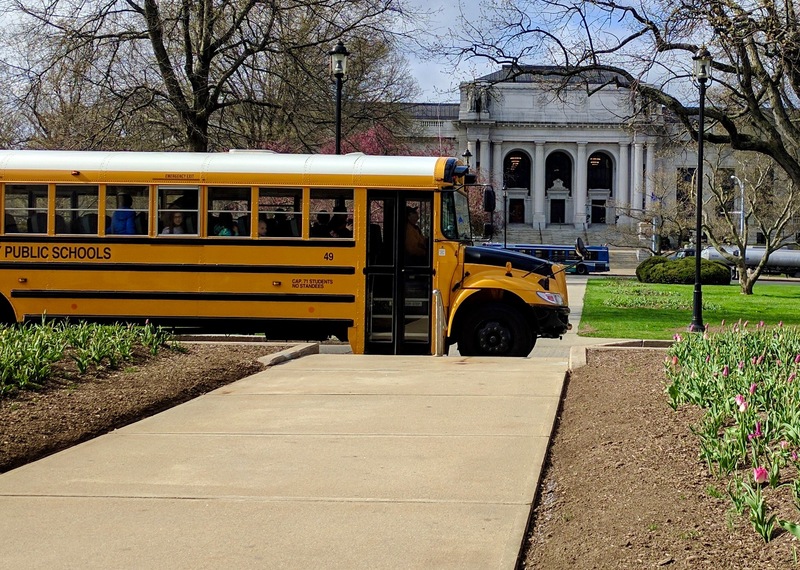 A school bus drops off public school students for a tour of the state Capitol. In the background is the state Supreme Court. The Connecticut Supreme Court ruled Wednesday that the state is providing students in Connecticut’s most impoverished school districts with the minimally adequate education the state constitution mandates. The 4-3 decision probably draws to a close a 12-year legal saga in which a group of mayors, teachers, school board members and parents teamed up to sue the state, alleging it is not providing enough funding for the state’s poorest districts to provide students with the education they deserve. While there is no question that schools are struggling to help students cope with the plights of poverty, mental health issues at home and other non-educational issues, the majority opinion released late Wednesday says that those are not constitutional obligations. 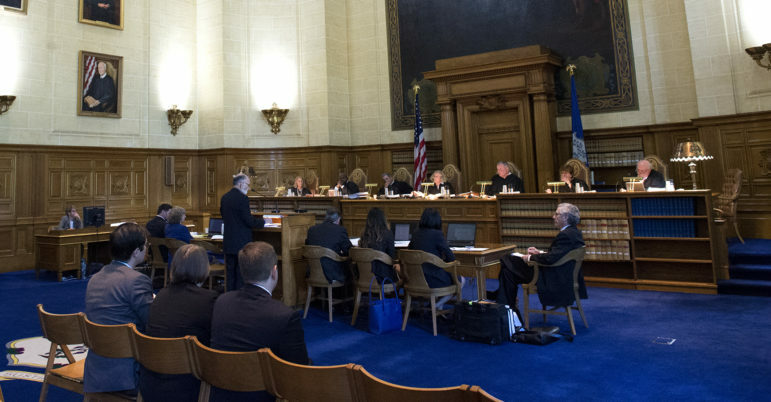 Three justices disagreed, however, and concluded the state still has an obligation to help students overcome the obstacles they face outside of school so they are able to learn when they are at school. “There should be no doubt [the constitution] requires not only that the state provide the essential components of a minimally adequate education, including facilities, instrumentalities, curricula, and personnel, but also that some reasonable effort be made to ensure that those modalities are designed to address the basic educational needs of at-risk learners in under-privileged communities,” the minority opinion reads. Those justices would have sent the case back for further trial to see whether that was being done in all districts. After a five-month trial, Superior Court Judge Thomas Moukawsher in September 2016 ruled that the state was providing adequate levels of funding for education overall – but how the state distributed funding and oversaw districts that failed to improve were not “rationally, substantially and verifiably connected to creating educational opportunities for children” and were thus unconstitutional. In setting a new so-called rationality standard, Moukawsher found the state was not meeting its constitutional obligations in the way it identified students as disabled, evaluated teachers, set high school graduation standards and distributed funding. All seven Supreme Court justices who heard the case, however, rejected Moukawsher’s application of that standard. In the aftermath of the lower court’s decision, state legislators and the governor largely ignored Moukawsher’s orders to overhaul teacher evaluation, student graduation standards, and the identification of students for special education services. However, lawmakers did change state law to reorganize how schools are funded – and promised funding increases for the state’s most impoverished communities in each of the next 10 fiscal years. The first of those increases – $82 million – is slated to begin in the fiscal year that begins July 1. However, now that there is no pending court decision surrounding school funding, legislators will have more flexibility to reconsider those priorities. Gov. Dannel P. Malloy, a Democrat, said the decision should not mean that lawmakers retreat from from what has been promised so far, and that more still needs to be done. “The urgency to continue the fight to distribute greater educational dollars where there is the greatest need has not diminished,” he said in a statement. “We continue to believe that the state is obligated to ensure that funding is distributed in a rational manner based on student need, reflecting student poverty and demographic shifts in our communities. Attorney General George Jepsen, whose office defended the state in this case, said it is clear there is work for the legislature ahead, regardless of the Supreme Court decision. “The trial court’s ruling in this case did identify profound educational challenges that deserve continuing significant and sustained action on the part of our state’s policymakers. Nothing about today’s ruling should alleviate any urgency on the part of state lawmakers to address these challenges,” said Jepsen. Jim Finley, the principle consultant for the group that sued the state, said the Connecticut Coalition for Justice in Education Funding (CJEF) is “deeply disappointed” and is planning on filing a motion asking the court to reconsider within the next 10 days. “The court’s job is to be the backstop so that our students rights are protected, particularly when the executive and legislative branches have not done so,” he said. Bridgeport Mayor Joe Ganim, a member of the coalition, said he was shocked. “How can you say that the state is meeting its constitutional obligation to provide an adequate education to Bridgeport’s 22,000 public school students when it only spends $14,000 per pupil, and in better off communities nearly double is spent on every student? This disparity means Bridgeport continuously struggles to find and retain good teachers and can barely provide enough school supplies for our kids,” Ganim said.